"Juan Carlos" redirects here. For other uses, see Juan Carlos (disambiguation). Juan Carlos I (Spanish: [xwaŋˈkaɾlos];[a] Juan Carlos Alfonso Víctor María de Borbón y Borbón-Dos Sicilias, born 5 January 1938) is a former King of Spain, reigning from 1975 until his abdication in 2014. Juan Carlos is the grandson of Alfonso XIII, the last king of Spain before the abolition of the monarchy in 1931 and the subsequent declaration of the Second Spanish Republic. Juan Carlos was born in Rome, Italy, during his family's exile. Generalísimo Francisco Franco, the Spanish dictator who initiated the civil war by means of a coup d'état against the constitutional republic in 1936, took over the government of Spain after his victory in the Spanish Civil War in 1939, and in 1947 Spain's status as a monarchy was affirmed and a law was passed allowing Franco to choose his successor. Juan Carlos's father, Juan, was the fourth child of Alfonso, who had renounced his claims to the throne in January 1941. Juan was seen by Franco to be too liberal and in 1969 was bypassed in favour of Juan Carlos as Franco's successor as head of state. Juan Carlos was born to Infante Juan, Count of Barcelona, and Princess María de las Mercedes of Bourbon-Two Sicilies in Rome, Italy, where his grandfather King Alfonso XIII of Spain and other members of the Spanish royal family lived in exile following the proclamation of the Second Spanish Republic in 1931. He was baptized as Juan Carlos Alfonso Víctor María de Borbón y Borbón-Dos Sicilias. He was given the name Juan Carlos after his father and maternal grandfather, Prince Carlos of Bourbon-Two Sicilies. His early life was dictated largely by the political concerns of his father and General Franco. He moved to Spain in 1948 to be educated there after his father persuaded Franco to allow it. He began his studies in San Sebastián and finished them in 1954 at the Instituto San Isidro in Madrid. He then joined the army, doing his officer training from 1955 to 1957 at the Military Academy of Zaragoza. Alfonso had won a local junior golf tournament earlier in the day, then went to evening Mass and rushed up to the room to see Juan Carlos who had come home for the Easter holidays from military school. It is alleged that Juan Carlos began playing with a gun that had apparently been given to Alfonso by General Franco. Rumors appeared in newspapers that the gun had actually been held by Juan Carlos at the moment the shot was fired. As they were alone in the room, it is unclear how Alfonso was shot, but according to Josefina Carolo, dressmaker to Juan Carlos's mother, Juan Carlos pointed the pistol at Alfonso and pulled the trigger, unaware that it was loaded. Bernardo Arnoso, a Portuguese friend of Juan Carlos, also said that Juan Carlos fired the pistol not knowing that it was loaded, and adding that the bullet ricocheted off a wall, hitting Alfonso in the face. Helena Matheopoulos, a Greek author who spoke with Juan Carlos's sister Pilar, said that Alfonso had been out of the room and when he returned and pushed the door open, the door knocked Juan Carlos in the arm, causing him to fire the pistol. Ultimately, Franco decided to skip a generation and name Juan de Borbón's son, Prince Juan Carlos, as his personal successor. Franco hoped the young prince could be groomed to take over the nation while still maintaining the ultraconservative and authoritarian nature of his regime. In 1969, Juan Carlos was officially designated heir-apparent and was given the new title of Prince of Spain (not the traditional Prince of Asturias). As a condition of being named heir-apparent, he was required to swear loyalty to Franco's Movimiento Nacional, which he did with little outward hesitation. His choice was ratified by the Spanish parliament on 22 July 1969. During periods of Franco's temporary incapacity in 1974 and 1975, Juan Carlos was acting head of state. On 30 October 1975, Franco gave full control to Juan Carlos; he died three weeks later, on 20 November. On 22 November, two days after Franco's death, the Cortes Españolas proclaimed Juan Carlos King of Spain. In his address to the Cortes, Juan Carlos spoke of three factors: historical tradition, national laws, and the will of the people, and in so doing referred to a process dating back to the Civil War of 1936–39. On 27 November, a Mass of the Holy Spirit was celebrated in the church of San Jerónimo el Real in Madrid to inaugurate his reign. He opted not to call himself Juan III or Carlos V, but Juan Carlos I. Juan Carlos is reported to have been pressured by Valéry Giscard d'Estaing to personally tell Chilean dictator Augusto Pinochet, who had traveled to Spain for Franco's funeral, not to attend his coronation. Royal trips of King Juan Carlos I from 1975 until 2010. The victory of the PSOE in 1982 under González marked the effective end of the King's active involvement in Spanish politics. González would govern for 14 years, longer than any democratically elected Prime Minister. His administration helped consolidate Spanish democracy and thus maintained the stability of the nation. A 5000 Spanish peseta note with the image of King Juan Carlos. Under the constitution, the King has immunity from prosecution in matters relating to his official duties. Consequently, he exercised most of his powers through the ministers; his acts as King (and not as a citizen) were not valid unless countersigned by a minister, who became politically responsible for the act in question. The honour of the Royal Family is specifically protected from insult by the Spanish Penal Code. Under this protection, Basque independentist Arnaldo Otegi and cartoonists from El Jueves were tried and punished. The King (left of centre, in grey suit with red necktie) standing with the leaders of all the other Iberoamerican Nations present at the XVIII Ibero-American Summit. Juan Carlos was married in Athens on 14 May 1962, to Princess Sophia of Greece and Denmark, daughter of King Paul of Greece, first in a Roman Catholic ceremony at the Church of St. Denis, followed by a Greek Orthodox ceremony at the Metropolitan Cathedral of Athens. She converted from her Greek Orthodox religion to Roman Catholicism. King Juan Carlos, Queen Sofía and then-Prime Minister José Luis Rodríguez Zapatero at the XV Ibero-American Summit (Salamanca, 2005). Juan Carlos is also the alleged illegitimate father of Alberto Sola, born in Barcelona in 1956, of María A. L. A, born in Catalonia in 1964, and of a Belgian woman, Ingrid Sartiau, who has filed a paternity suit but complete sovereign immunity had prevented the suit prior to his abdication. Iñaki Urdangarin, who married Juan Carlos's daughter Cristina in 1997, became embroiled in a financial scandal in 2011 and was convicted of tax evasion in 2017. Juan Carlos is a member of the World Scout Foundation and of the Sons of the American Revolution. Juan Carlos I is also a black belt in karate. 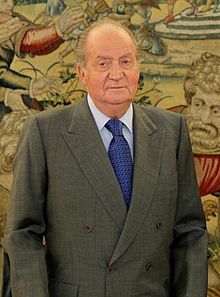 A benign 17-19mm tumour was removed under general anaesthetic from King Juan Carlos's right lung in an operation carried out in the "Hospital Clínic" of Barcelona in May 2010. The operation followed an annual check-up, and Juan Carlos was not expected to need any further treatment. In April 2012, the King underwent surgery for a triple fracture of the hip at the San Jose Hospital, Madrid, following a fall on a private elephant-hunting trip to Botswana. He also underwent a hip operation in September 2013 at Madrid's Quirón hospital. In April 2018, Juan Carlos was admitted to hospital for a surgery on his right knee. Spanish news media speculated about the King's future in early 2014, following criticism and family scandal; the King's chief of staff in a briefing denied that the 'abdication option' was being considered. On the morning of 2 June 2014, Prime Minister Mariano Rajoy made a televised announcement that the King had told him of his intention to abdicate. Later, the King delivered a televised address and announced that he would abdicate the throne in favour of the Prince of Asturias. Royal officials described the King's choice as a personal decision which he had been contemplating since his 76th birthday at the start of the year. The King reportedly said, "No queremos que mi hijo se marchite esperando como el príncipe Carlos." (English: "[I] do not want my son to wither waiting like Prince Charles.") As required by the Spanish constitution, any abdication would be settled by means of an organic law. A draft law was passed with 299 in favour, 19 against and 23 abstaining. On 18 June, he signed the organic law passed by parliament several hours before his abdication took effect. Felipe was enthroned on 19 June 2014, and Juan Carlos's granddaughter Leonor became the new Princess of Asturias. In 1969, Juan Carlos was named as General Franco's successor and was given the title of 'Prince of Spain'. Upon the death of Franco in 1975, Juan Carlos acceded to the throne of Spain. The current Spanish constitution refers to the monarch by the simple title "King of Spain". Aside from this title, the constitution allows for the use of other historic titles pertaining to the Spanish monarchy, without specifying them. This was also reiterated by a decree promulgated on 6 November 1987 concerning titles of members of the royal family. Since his abdication in 2014, King Juan Carlos has retained, by courtesy, the title and style of King that he enjoyed during his reign. The blazoning of the coat of arms of the King of Spain is set out in Title II, Rule 1, of Spanish Royal Decree 1511 of 21 January 1977, by which the Rules for Flags, Standards, Guidons, Banners, and Badges were adopted. Base point, the yoke with ribbons and the sheaf of five arrows. King Juan Carlos's personal Royal Standard is a dark blue square with his coat of arms. The first quarter represents Castile, the second León, the third Aragon and the fourth Navarre; enté en point the arms of Granada and on the escutcheon of pretence the ancestral arms of Bourbon-Anjou are represented. The coat of arms used as Prince of Spain which was virtually identical to the one later adopted when he became King, differed only that it featured the crown of heir to the throne, decorated with only four half-arches." It has been suggested that Ancestry of Juan Carlos I of Spain be merged into this article. (Discuss) Proposed since October 2018. ^ "His Majesty the King Juan Carlos". The Royal Household of His Majesty the King!. Archived from the original on 22 August 2012. ^ "Juan Carlos most popular leader in Ibero-America (Spanish)". Elmundo.es. Retrieved 2 June 2014. ^ a b "BBC News – Profile: Spain's Juan Carlos". Bbc.co.uk. 2 June 2014. Retrieved 10 June 2014. ^ Quoted in Paul Preston, Juan Carlos: Steering Spain from Dictatorship to Democracy (New York: W. W. Norton, 2004), 101. ^ "Royal Foibles". Retrieved 5 June 2014. ^ Davison, Phil (16 October 1992). "Juan Carlos lays to rest a haunting Spanish tragedy". The Independent. London. Retrieved 5 June 2014. ^ "Chapter 26: A History of Spain and Portugal vol. 2". Libro.uca.edu. Retrieved 10 June 2014. ^ a b c d e f Bernecker, Walther (January 1998). "Monarchy and Democracy: The Political Role of King Juan Carlos in the Spanish Transición". Journal of Contemporary History. 33 (1): 65–84. ^ "The reign in Spain of King Juan Carlos". TheWhig.com. The Kingston Whig-Standard. Retrieved 3 June 2014. ^ Powell, Charles (1996). Juan Carlos of Spain. St Anthony's Series. Oxford, UK: MacMillan Press. pp. 1–5, 9, 13–14, 27–28, 50–51, 221–222. ISBN 0-333-54726-8. ^ "Juan Carlos I jura como sucesor de Franco". Youtube. 22 July 1969. Retrieved 3 June 2014. ^ "Marca España | Historia | The years of the Franco regime". Marcaespana.es. Archived from the original on 6 June 2014. Retrieved 10 June 2014. ^ "Spain: Juan Carlos coronation ceremony | OnlineFootage". Onlinefootage.tv. 22 November 1975. Retrieved 10 June 2014. ^ Cedéo Alvarado, Ernesto (February 4, 2008). "Rey Juan Carlos abochornó a Pinochet". Panamá América. Retrieved April 4, 2016. ^ a b c "Spain – The Post-Franco Era". Countrystudies.us. Retrieved 10 June 2014. ^ "BBC News – Spain's first post-Franco PM, Adolfo Suarez, dies at 81". Bbc.co.uk. 23 March 2014. Retrieved 10 June 2014. ^ Richard Tomlinson (2 April 1993). "Obituary: Don Juan de Borbon". The Independent. London. Retrieved 10 June 2014. ^ "Título II. De la Corona, Wikisource" (in Spanish). Es.wikisource.org. Retrieved 2 June 2014. "The Crown shall be inherited by the successors of H.M. Juan Carlos I de Borbón, the legitimate heir of the historic dynasty." ^ "El Rey abdica: La utilidad de un rey | Política | EL PAÍS". Politica.elpais.com. 2 June 2014. Retrieved 10 June 2014. ^ "El retiro del Rey". El Pais. 1 January 1970. Retrieved 10 June 2014. ^ Brooks, Anita (26 February 2010). "Spanish King rebrands for the recession – Europe – World". London: The Independent. Retrieved 10 June 2014. ^ Basque convicted for king insult, BBC News, 4 November 2005. Retrieved 29 December 2007. ^ Cardyn, Hans. "'Belager' koning Albert komt er goedkoop vanaf" (in Dutch). Gazet Van Antwerpen. Archived from the original on 17 March 2008. Retrieved 29 December 2007. ^ Tarvainen, Sinikka (28 September 2007). "Spanish royals worried about protests against monarchy". EUX.TV. Archived from the original on 1 December 2008. Retrieved 29 December 2007. ^ a b Minder, Raphael (15 April 2012). "Spanish King's Hip Surgery Follows Controversial Hunting Trip". The New York Times. ^ Winds of change: The rights, wrongs, abdication and legacy of King Juan Carlos, economist.com. ^ a b "Row over hunting trip for Spanish King Juan Carlos". BBC News. 16 April 2012. ^ a b Heckle, Harold (15 April 2012). "Spanish King Juan Carlos Elephant-Hunting Trip Causes Outrage, Injures Hip In Botswana And Requires Surgery". Huffington Post. Associated Press. ^ "WWF asks to speak to king". Worldwildlife.org. Retrieved 2 June 2014. ^ "Spain king ousted as honorary president of World Wildlife Fund branch after elephant hunt". Washington Post. Madrid. Associated Press. 21 July 2012. Archived from the original on 23 July 2012. Retrieved 11 March 2019. ^ "Spain's King Juan Carlos meets with Bill Clinton". Fox News. 23 September 2012. Archived from the original on 5 June 2014. ^ Mailet, Victor (18 April 2012). "Spanish king apologises for hunting trip". FT. Retrieved 7 May 2012. ^ "Juan Carlos I es mi padre". El Español. 29 November 2018. Retrieved 30 November 2018. ^ Bajekal, Nainia (15 January 2015). "Former Spanish King Faces Paternity Suit". Time. Retrieved 23 January 2015. ^ Jones, Sam (2017-02-17). "Spain's Princess Cristina acquitted in tax fraud trial". The Guardian. Retrieved 2017-11-18. ^ "El Rey Don Juan Carlos adquiere un velero de 1929, en Finlandia". elmundo.es. ^ "Einladung zun Pressegespräch am 18.September-World Scout Foundation in Österreich-Seine Mäjestät Carl XVI von Schweden zu Gast in Wien" (PDF) (in German). Pfadfinder und Pfadfinderinnen Österreichs. Archived from the original (PDF) on 3 October 2008. Retrieved 14 September 2008. ^ "Spanish King Juan Carlos in hip surgery after fall". BBC News. 14 April 2012. ^ "SPAIN'S KING TO UNDERGO HIP SURGERY TUESDAY". Associated Press. Retrieved 22 September 2013. ^ Pearl, Diana (9 April 2018). "Queen Letizia and Queen Sofia Reunite After Their Tense Exchange on Easter Was Caught on Camera". People. Retrieved 2 May 2018. ^ "Desglose presupuestario". Archived from the original on 13 August 2012. ^ a b "King Juan Carlos of Spain abdicates". BBC News. 5 January 2013. Retrieved 2 June 2014. ^ Minder, Raphael (2 June 2014). "King Juan Carlos of Spain to Abdicate Throne for Son". The New York Times. ^ Govan, Fiona (2 June 2014). "King Juan Carlos: 'No queremos que mi hijo se marchite esperando como el príncipe Carlos'" ['I don't want my son to grow old waiting like Prince Charles']. The Daily Telegraph. London. Retrieved 10 June 2014. ^ "Spanish Constitution of 1978" (PDF). Boletin Oficial del Estado (BOE). Retrieved 5 January 2016. ^ Keeley, Graham (12 June 2014). "Spanish MPs back abdication of Juan Carlos". The Times. Retrieved 13 January 2016. ^ "Spanish cabinet to discuss King Juan Carlos's abdication". BBC News. 3 June 2014. Retrieved 3 June 2014. ^ "Spanish politicians set out abdication timetable". BBC News. 3 June 2014. Retrieved 10 June 2014. ^ Fantz, Ashley; Levs, Josh (3 June 2014). "Abdications through history". CNN. Retrieved 3 June 2014. ^ Ellakuría, Iñaki (3 June 2014). "El Rey perderá su inviolabilidad tras la abdicación pero puede pasar a ser aforado [The King will lose his immunity after abdicating but could keep it]". La Vanguardia. Retrieved 5 June 2014. ^ a b Govan, Fiona (13 June 2014). "Spain will have two kings and two queens". The Daily Telegraph. London. Retrieved 14 June 2014. ^ "The guardian". Retrieved 5 August 2014. ^ a b "BBC News – Press sees Spain at "crossroads"". Bbc.co.uk. 3 June 2014. Retrieved 10 June 2014. ^ "King Carlos abdication: Thousands join anti-monarchy protest". BBC News. 3 June 2014. Retrieved 10 June 2014. ^ Ben Quinn. "Spaniards in London echo calls for referendum on monarchy". The Guardian. London. Retrieved 10 June 2014. ^ "Urkullu recuerda al futuro Rey que "la cuestión vasca no está resuelta" [Urkullu reminds the future king that "the Basque Question is not yet resolved"]". El Correo. 2 June 2014. Retrieved 5 June 2014. ^ "Feijóo agradece el trabajo del Rey y ve a Felipe preparado para el relevo [Feijóo thanks the work of the king and sees Felipe as prepared for the future]". Faro de Vigo. 2 June 2014. Retrieved 5 June 2014. ^ "Alberto Fabra transmite a S.M. el Rey el 'respeto, reconocimiento y admiración del pueblo valenciano' [Alberto Fabra sends to H.M. the King the "respect, recognition and admiration of the Valencian people"]". Informaria. 2 June 2014. Archived from the original on 2 June 2014. Retrieved 5 June 2014. ^ "Cameron destaca la contribución del rey Juan Carlos a la democracia [Cameron highlights the contribution of King Juan Carlos to democracy]". La Vanguardia. 2 June 2014. Retrieved 5 June 2014. ^ "Durao Barroso elogia al Rey como "valedor fundamental del europeísmo y de la modernidad en España" [Durao Barroso eulogises the King as a "fundamental believer in Europeanism and modernity in Spain"". El Economista. 2 June 2014. Retrieved 5 June 2014. ^ Govan, Fiona (9 June 2014). "Spanish royal family's popularity boosted by King Juan Carlos's abdication in favour of Prince Felipe". The Daily Telegraph. London. Retrieved 10 June 2014. 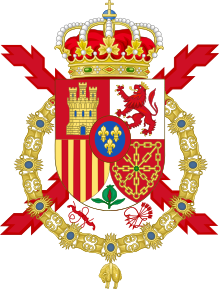 ^ a b "Coat of arms of His Majesty the King Juan Carlos". Spanish Royal Household Website. 19 June 2014. Retrieved 20 June 2014. Wilsford, David, ed. Political leaders of contemporary Western Europe: a biographical dictionary (Greenwood, 1995) pp. 207–15. Wikimedia Commons has media related to Juan Carlos I of Spain.